It was the final lunar eclipse of the year, and the last total lunar eclipse event for the western portion of the Americas until 2014, so skywatchers took advantage of clear skies, and many have shared their images and videos with Universe Today. Enjoy the views! For many of the images you can click on them and see larger versions on our Flickr group. 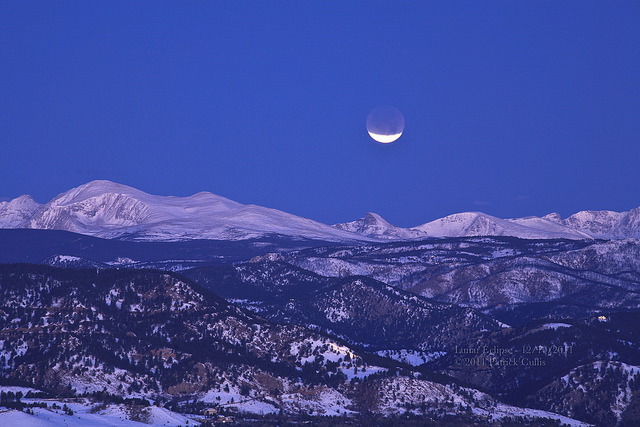 Above is a view in Colorado, taken by Patrick Cullis, showing the Indian Peaks with the eclipsing Moon setting overhead, taken during the lunar eclipse in the early morning hours of December 10, 2011. The Indian Peaks are a series of peaks on the continental divide near Boulder, Colorado. “The Moon set behind the continental divide right before totality, but it was still an awesome sight,” Cullis said. Below is a video a to-die-for view of the eclipse over the Pacific Ocean. Now updated with more images and video! It was an event that hasn’t happened in 11 years and won’t happen again until 2018. The total lunar eclipse of June 15, 2011 didn’t disappoint. Take a look at some of the amazing images taken by astrophotographers from around the world — well, the “eastern” side of the world anyway, as the eclipse wasn’t visible in North and South America. Our lead image is a fantastic mosaic taken by Marko Posavec in Koprivnica, Croatia. We have another image by Posavic below, but you can see more of his images via his Twitter account. A blood red Moon as seen by Leonard E. Mercer in Malta. The redness of the Moon during the eclipse was perhaps enhanced by the major volcanic eruption in Chile which has polluted the stratosphere with a haze, making the eclipse appear dark red. This image was taken by Leonard Mercer in Malta. You can see more of his images at his website. Here’s a nice shot of the eclipsed Moon in Pisa, Italy, sent via Twitter from @UgoRom. Here’s two skywatching events at once: and ISS flyby along with the eclipse, taken by Marko Posavec in Croatia. Daniel Fischer from Germany, who writes the Cosmos4U blog and Skyweek German blog, took this image and said, “against all odds skies cleared *and* the geometry was better than expected about 10 minutes after totality. This is when this picture was taken, the reddish (outer) umbra still very evident.” You can read his recap of the eclipse here. A panoramic view of the eclipse near Ankara, Turkey. Credit: M. Rasid Tugral. This beautiful panorama was taken near Ankara, Turkey and sent in by M. Rasid Tugral. This image from Switzerland was sent in by Alistair Scott, author of The Greatest Guide to Photography. The Moon during the early part of the June 15, 2011 eclipse over Tehran, Iran. Credit: Saeed Amiri and Hadi Emami. A red, eclipsed Moon over Tehran, Iran. Credit: Saeed Amiri and Hadi Emami. The two images above were sent in by Saeed Amiri Hadi Emami in Tehran, Iran, who took them with Canon SX210 camera. On June 15 there will be a total lunar eclipse visible from Australia, Indonesia, southern Japan, India, a large area of Asia, Africa, Europe and the eastern part of South America. This is expected to be one of the darkest eclipses ever (with a magnitude of 1.7), second only to the July 2000 eclipse. Sadly it won’t be visible to viewers in North America, but much of the rest of the world should be treated to a wonderful show as the Moon slips into Earth’s shadow. Gradually growing darker from its western limb inwards, the Moon then gains a bluish cast which transitions to orange then deep red as it moves into light passing through the edge of Earth’s atmosphere (the same as what makes the colors of a sunset) and then eventually going almost completely dark before the process then reverses itself from the opposite side. The entire eclipse will last 5 hours and 39 minutes, with a totality duration of 1 hour and 40 minutes. It will begin at 17:23 UT. Viewers in Australia and eastern Asia will see the eclipse begin as the Moon is setting while those in Europe and South America will see it as the Moon is rising. Only locations in India, eastern Africa, the Middle East and western Asia will experience the entire eclipse. This is the first of two total lunar eclipses in 2011; the next will take place on December 10. I saw my first total lunar eclipse last December, which took place on the night of the winter solstice (December 21). It really was an amazing event to watch… in totality the Moon was colored a deep coppery red and really just seemed to be suspended among the stars – it felt like you could just reach up and pluck it from the sky! If you are in any of the areas where this next one is visible I encourage you to check it out for yourself! Read more about lunar eclipses on MrEclipse.com. In this season of Christmas tidings, many of us were blessed to witness the eerie Red Moon of the total lunar eclipse a few nights ago on Dec. 21. Here in “bonechilling” New Jersey, it was miraculously crystal clear the entire night from the beginning around 1:30 a.m. EST to the end – about three and one half hours later at around 5 a.m.
UPDATE: Check out more readers “Red Moon, Red Planet” astropix contributions below ! The eclipse occurred as the moon passed through the Earth’s inner dark shadow, or umbra and changed dramatically to varying shades of red, orange and brown. During totality – when the moon was completely immersed in the umbral shadow for about 72 minutes – the red moon changed from a faint red glow to a brilliant crimson red. At times it appeared to be blood red and as though the surface was stirring and oozing droplets of warm and viscous blood. It was surreal and looked to me as though it had been magically and majestically painted up into the night sky. Well all this redness hanging in the sky during totality caused me to ponder Mars – the Red Planet – especially with the avalanche of good news streaming back lately. And the wispy white light at near total eclipse harkened to the Martian polar ice caps. Bright red Mars at Opposition in 2003 - The year that Spirit and Opportunity launched. So please send your telescopic shots and descriptions of the Red Planet and/or the Red Moon and I’ll post them here. Email kremerken at yahoo dot com or post as comments to add here. Looking up at the sky it was easy to imagine Opportunity newly arrived at the gorgeous Martian crater Santa Maria, hunting for minerals spotted from orbit that could influence the search for life, as Odyssey circles about at a record setting pace and transmits those tell tale clues back to scientists waiting on Earth. Despite the shadow the moon does not completely disappear. The red moon’s glow was caused by sunlight refracted through the earth’s atmosphere and cast upon the lunar surface. The hue varies depending on a variety of atmospheric conditions and can be intensified by floating clouds of volcanic ash and dust. The recent volcanic eruptions at Mount Merapi in Indonesia in October and at Mount Eyjafjallajökull in Iceland last April sent massive plumes of particles skyward which may have influenced the thrilling event. Red Moon, Red Planet. One day we’ll journey there and back again. From Robert Vanderbei of Amateur Astronomers Association Of Princeton in New Jersey; A Lunar Eclipse Montage ! Just ahead of the monster blizzard which struck the northeast Corridor of the US on Dec 26. Some pictures of the eclipse put together as a composite from beginning to totality by Russell King of Willingboro Astronomical Society, New Jersey. Happy New Year! Thanks to Nathanial Burton-Bradford for sharing his photo of the New Year’s Eve Blue Moon Eclipse. “Very hazy high level clouds over Cornwall so not very clear, unfortunately,” Nathanial wrote this morning. But beautifully breathtaking nonetheless!